For a modern and powerful full-size pickup truck, be sure to see Nissan's latest Titan. The second-generation Nissan Titan has arrived for the 2016 and 2017 model years, and is available now at Vann York Nissan, serving Greensboro, NC and beyond. An all-new heavy-duty model, the Titan XD, debuted for 2016, while the second-generation light-duty Nissan Titan arrived as a 2017 model. Thanks to fresh styling inside and out, new powertrain choices and innovative new features, the new Nissan Titan should be on the test drive list of any pickup truck buyer. 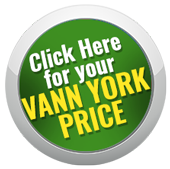 To discover the new Nissan Titan for yourself near Greensboro, NC, visit Vann York Nissan. Or, shop for a new Nissan Titan for sale near Greensboro now, right here on our website. From the commanding power and torque of the all-new V8 and Cummins 5.0-liter V8 Turbo Diesel engine to the fuel-efficient yet highly capable Nissan V6 motor, Titan buyers have quite the choice of high-performance powertrains. Nissan's new 5.6-liter V8 and V6 engine are available in the new Titan light-duty pickup, while the heavy-duty Titan XD model can be had with either the 5.6-liter V8 or the torque-happy Cummins 5.0-liter V8 Turbo Diesel. Nissan has engineered each available powertrain to maximize power and torque, so whether you are taking your truck to the job site or the boat launch, your Titan has the guts to get any job done right. One of the clear highlights of the Titan's new cabin is its flexible rear seating, which offers a range of configurations and features like an under-seat storage tray, virtual workbench, fold-flat floor panels and a rear seat cargo organizer. Available features include a full-color 7-inch NissanConnect display, Advanced Drive Assist Display, Nissan Intelligent Key with push-button start, wood-tone interior accents and a soft-touch dash. For a full-size pickup truck outfitted with sporty 20-inch aluminum alloy wheels, premium leather-appointed seats, Around View Monitor and TITAN Boxes as standard equipment, opt for the range-topping Titan Platinum Reserve model. Come and test drive the new Nissan Titan full-size pickup truck near the Greensboro area of North Carolina at Vann York Nissan. Before your visit to our dealership in High Point, NC, browse our website where you can research Titan trim levels and options, apply for auto financing and value your trade.